This time management college activity highlights the importance of students prioritizing tasks. This activity highlights the importance of protecting the vital few activities from the trivial many tasks. But lets face it....college life can be overwhelming and stressful! An assignment is due, readings have to be done, there's an exam to sit! Not to mention your social life and outside work or sporting obligations! Having too much to do and not enough time is a major cause of student stress. But if you master your time management for students then you can improve your grades, and have a more rewarding and successful college life with less stress. Also, good time management is a skill that is looked for by many employers! Are you getting your big rocks done at college and in your life? The 'Big Rocks Little Rocks' story starts with a professor who stands in front of a class holding a glass jar, into which he places a number of large rocks. After filling the jar with large rocks the professor asks the students, "Is the jar full yet?" Most of the class reply, "Yes!" 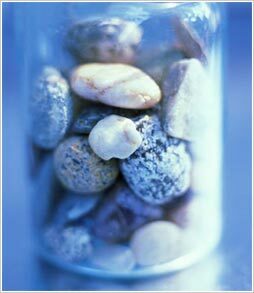 Then he reaches into his pocket and pulls out a number of smaller rocks and puts them into jar with the big rocks. After which he says, "Is the jar full yet?" Still many in the class reply "Yes!" From the other pocket the professor pulls out a bag of sand and proceeds to fill the glass jar. The sand fills the gaps between the big and small rocks. Again he asks, "Is the jar full yet?" Some of the class reply guardedly, "Yes it's now full." The professor now produces a glass of water and proceeds to pour the water into the jar. The water seeps into the sand and finally fills the jar. "What is the moral of the story?" the professor asks. One girl replied "That no matter how full the jar, you can always fit more into it". "The moral of the story" said the professor, "is that you need to get the big rocks of your day or life out of the way first or all the other small stuff will get in the way and take up space"
If the professor had first filled his jar with sand and small rocks then he never would be able to put the big rocks into the jar. This story highlights that it is important to get the big rocks of your life, those high impact activities, into the jar before the smaller stuff crowds it out. To know what your big rocks are you need to be able to figure out what it is about college life that you want. Do you want good grades? Are you a student who believes that anything higher than a pass is wasted effort? Are you a student who wants to genuinely learn their art and good grades are just a by-product. In essence - what drives you as a student? By having a vision of what you want to achieve, whether it is good grades or a dream job, knowing how you will achieve your vision is the essence of student goal setting. Student goal setting keeps you motivated, gives you confidence, and helps you to persist when the last thing you want to do is to sit at the desk and study. In this time management college story your big rocks are your most important tasks. But often urgent tasks can crowd out the important. Do you feel like you are constantly putting out fires? Cramming for exams, pulling all-nighters to finish an assignment, or jumping from deadline to deadline can be stressful! It is also not the environment that you best work is likely to be produced! Here’s how to ensure you get your big rocks done. Step 1: Do you have an academic planner? If not, then download one from our annual planner article. Step 2: Download your master to do list (PDF file). Enter all the things you want to do in the next next week. Make sure that you put some of your actions from your student goal setting. Step 3: Choose the six most important things on your master to do list schedule them into your weekly student planner tool. Step 4: Schedule the other activities into your weekly planner. Try to reduce procrastination with these student procrastination tips. Diagnose potential time management problems with this time management and students activity log. Follow these time management for college students tips. If you liked this time management college activity then you will also like these study techniques.